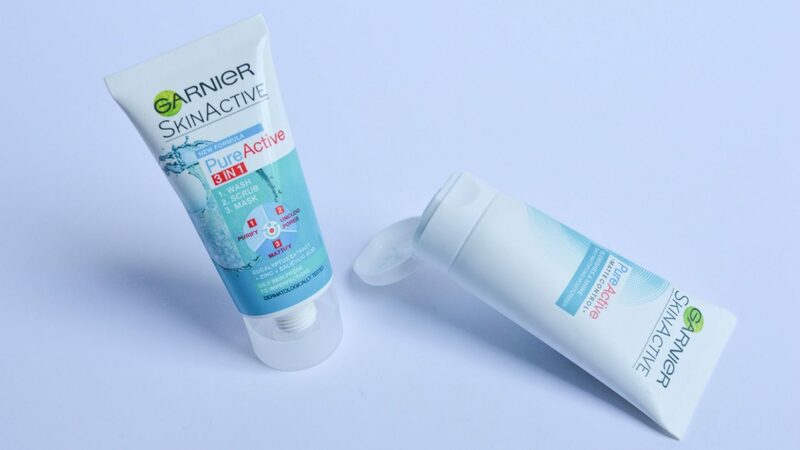 Garnier Pure Active – My Secret To Clear, Even, Unproblematic Skin.. I am an oily mess, and anyone that has read my blog before will know this by now. I will try anything and everything that claims to help keep my oils at bay, and while I wouldn’t say I’m prone to break outs, I tend to get a few all at once, rather than having one or two spots regularly. I’m always on the look out for skincare recommendations from my fellow oily gals, which is where the Garnier Pure Active Range comes into play.. I originally only headed to my local Superdrug store to pick up the Garnier Pure Active Matte Control Anti Blemish Face Moisturiser, recommended by the gorgeous Katie on Twitter. I knew straight away that I had to get my hands on it – her tweet about it being perfect for oily skin, keeping her matte all day and being the best makeup primer she’d ever used had me almost completely sold. I was, however, a little dubious as I always am when products claim to do everything you could ever want and more, just as this moisturiser had. Can a single product really control your oils, keep you blemish free and moisturise your face all at once? The moisturiser on it’s own retails for £7.39, but while in store, I spotted the Garnier Pure Active Clear Skin Kit for Oily Skin which contained three products for £9.99. 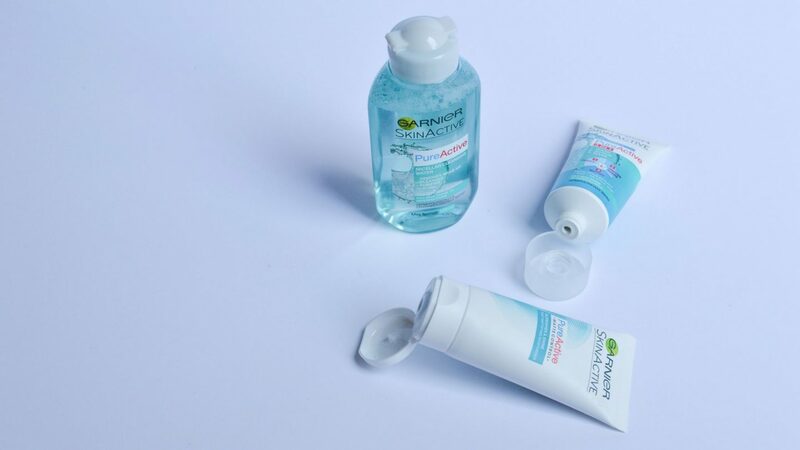 The Clear Skin Kit contains a travel size Pure Active Micellar Water, a mini Pure Active Clay Mask Scrub and Wash, and a full-sized Matte Control Moisturiser. I obviously couldn’t resist for an extra pound something, and was excited to give the entire range a try.. The first step of the regime is to cleanse, to remove makeup, daily dirt and any excess oil. I know it can be a slightly controversial product, but I myself have always been a huge fan of Garnier Micellar Water. I tend to stick to the one designed for Sensitive Skin, but I always get excited for new releases and I had recently picked up the full-sized version of the Pure Active Micellar Water before I purchased the kit. A noticeable difference between the two on first use is the smell. The Pure Active Micellar Water has almost a chemically smell to it, where as the Sensitive Skin Micellar Water has no smell at all. The smell itself reminds me of spot treatments from my teenage years, and while it may only be a placebo effect, it makes me think that it will combat any current spots more effectively. The product itself can be used to remove makeup as well as dirt and excess oil, but I’ve been using it after my makeup has been removed and I’ve cleansed for the first time, as a second cleanse almost. The Garnier Pure Active Micellar Water leaves the skin a little more dry after use than the one designed for Sensitive Skin, but I’ve also found this to be effective in drying out any current spots or blemishes on the skin, meaning that by morning, they’re almost non-existent. The second step targets uneven skin tone and pores that are clogged. The Clay Mask Scrub and Wash has, unsurprisingly, three different ways that it can be used. Using it as a mask evens skin tone, and is best done once or twice a week for a few minutes, which is my personal favourite way of using the product. As an exfoliating scrub, it can be used to unclog pores, and as a wash, it can be used to remove excess oil, both of which can be done daily or a few times a week. As the set only came with a mini, I didn’t want to use it every day and get through it too quickly, so I chose to use it as a mask and continue using other products to wash and exfoliate my skin daily instead. Unlike most other masks, this instructs you to only leave it on for a few minutes maximum, which makes it super easy to fit into your cleansing routine and is something that I loved. Having used it a few times, I’m a big fan of the product. I found that it wasn’t too harsh on the skin, which some exfoliating products can be, and it didn’t have a stinging sensation like some masks, which always makes me worry that I might be allergic to something or that it’s dramatically burning my skin off. I also loved that the smell wasn’t ridiculously strong, and I could visibly see a difference after using it, which I’m always a big fan of as well. The third step is targeting skin that is shiny and dehydrated. As I mentioned earlier, this was the product that made me buy the entire set, so I was super excited to try it out myself. The Matte Control Anti Blemish Face Moisturiser has a similar, almost chemically smell to the Micellar Water and is almost blue in colour to begin with, before blending out to be transparent. I found it a little difficult at first to judge how much product I needed, because it soaks in and dries down to the skin super quickly which made it difficult to know where had had enough product applied. However, I loved that it didn’t leave my skin feeling super tacky or overly-oily after applying, and I didn’t have to pause my makeup routine waiting for the product to soak in, which is something I hate normally. Over the Bank Holiday Weekend, I used this as my moisturiser alongside The Body Shop Tea Tree Primer, and I found that my makeup looked flawless for the entire day, even through the thirty degree heat. I find that it can be difficult to judge how well an individual product has worked for you when you change so many elements to your routine, but all three have left my skin ridiculously soft, almost entirely blemish free (minus one or two tiny, barely noticeable and easily covered spots during the few weeks that I’ve been trying out the products) and considerably less oily, even on days where I’ve been a lot more sweaty and should’ve been a lot more oily than normal. A set that cost less than £10 has genuinely changed my skin for the better, and I couldn’t recommend it enough..
Have you tried anything from the Garnier Pure Active Range? Are you a lover or a hater of Micellar Water? I use affiliate links throughout my blog, please see my disclaimer if more information is needed. "Six Things You’ll Read On Tinder – And What They Actually Mean.."
"Yet Another Primer Review – Too Faced Primed & Poreless Primer.."